The state government is all set to beautify and preserve the samadhi of eminent Sikh Gen Sham Singh Attariwala to develop the place as a befitting memorial and a centre of tourist attraction. The Punjab Tourism Department has initiated efforts to ensure the proper conservation of the memorial and site. This was stated by state Information and Public Relations Minister Sewa Singh Sekhwan while addressing a gathering at a state-level commemorative function held on Attariwala’s 164th martyrdom day here today. “The state government is doing its all out efforts to beautify the Attariwala’s samadhi and work is in full swing,” said Sekhwan. On behalf of the state government, he assured that adequate funds would be provided to pursue the restoration and conservation work of the historic place. Paying tributes to the great warrior, Sekhwan said the Sikh history was studded with glorious sagas of valiance of warriors and freedom fighters, who made unparallelled sacrifices for the country. Earlier, Sekhwan, along with MP Rajmohinder Majitha; zila parishad chairman Rajinder Kumar Jayntipur; zila parishad vice-chairman Gurwinderpal Singh Ranike, ADC Paramjit Singh, Deputy Director, Sainik Welfare, Col JD Bhullar (retd. ), and chairman of the Sardar Sham Singh Attariwala Trust Col Kuldip Singh (retd) laid wreaths on the statue of Sham Singh Attariwala at Nariangarh Chowk. 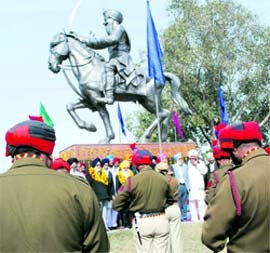 A contingent of the Punjab Police reversed the arms and paid tributes to the great warrior. The Trust Chairman hailed the initiative of the state towards organising a memorable state-level function.